On 29th May, WWE aired the 1253rd episode of Monday Night RAW live on the USA Network from the Bon Secours Wellness Center in Greenville, North Carolina. The show featured Samoa Joe, Finn Balor and Bray Wyatt in a Triple Threat match, former Shield buddies Roman Reigns and Seth Rollins facing off for the first time in nearly a year, Cruiserweight Champion Neville tagging with TJP against his #1 Contender Austin Aries and Gentleman Jack Gallagher as well as The Hardy Boyz, The Miz, Cesaro and Intercontinental Champion Dean Ambrose. But was it any good? Let's take a look. Michael Cole and Corey Graves welcomed us to the show on Memorial Day in the US, reminding us that Bray Wyatt, Finn Balor and Samoa Joe will face off in a triple threat and Roman Reigns will battle Seth Rollins tonight. A strong opening segment, with a number of different faces getting the opportunity to open the show. The Miz continued to be an utter head magnet as he opened the episode, easily working the Greenville crowd by saying "Don't cheer him" after mentioning WWE Intercontinental Champion Dean Ambrose, leading to the crowd chanting even louder. The interview with Cesaro & Sheamus saw some lovely work by both sides as they bounced off each other and feed each other even more heat, with the tag team duo benefiting from sharing mic time with a man who can get the crowd going nuts by just putting his hand in the air. The rest of the segment was paint-by-numbers stuff, but done well, as Ambrose came out to interrupt, playing it as if it's so unstable he's ready to fight three on one, with Miz taking the bait telling Ambrose to "do the math" (sic), only for RAW Tag Team Champions The Hardy Boyz music to hit and the crowd to go nuts. We close the heels getting chucked out of the ring to send us to break. Lovely stuff. This was heading towards being a very strong opening match, with some well-paced trios action, until an awkward finish took some of the shine away. Miz and Matt Hardy's closing exchanged looked like neither man was quite sure what they were supposed to be doing as they randomly touched each other before Miz took a Twist of Fate like a swinging neckbreaker. There was however a lot of good work from both sides earlier on in the match as Matt and Ambrose both had spells as the face in peril and Cesaro & Sheamus continued to develop their interesting take on the bruising heel tag team. I particularly liked Ambrose's hot tag, that saw the villains try a number of underhanded tactics to take control only for them to backfire, like Cesaro attempting to stop an Ambrose suicide dive onto Sheamus, only for Jeff Hardy to come flying in with a baseball slide. The build to a hot tag to Jeff was the strongest part of the bout with Cesaro getting a lot of heat for booting Hardy off the apron, meaning Matt's tag had to go to Ambrose. However when it eventually came I don't think it lived up to the work that had been done previously and left the conclusion feeling a little flat, obviously this wasn't helped by the aforementioned exchange between Matt and Miz. Corey Graves showed General Manager Kurt Angle something on his phone that could "ruin" Angle...mysterious. 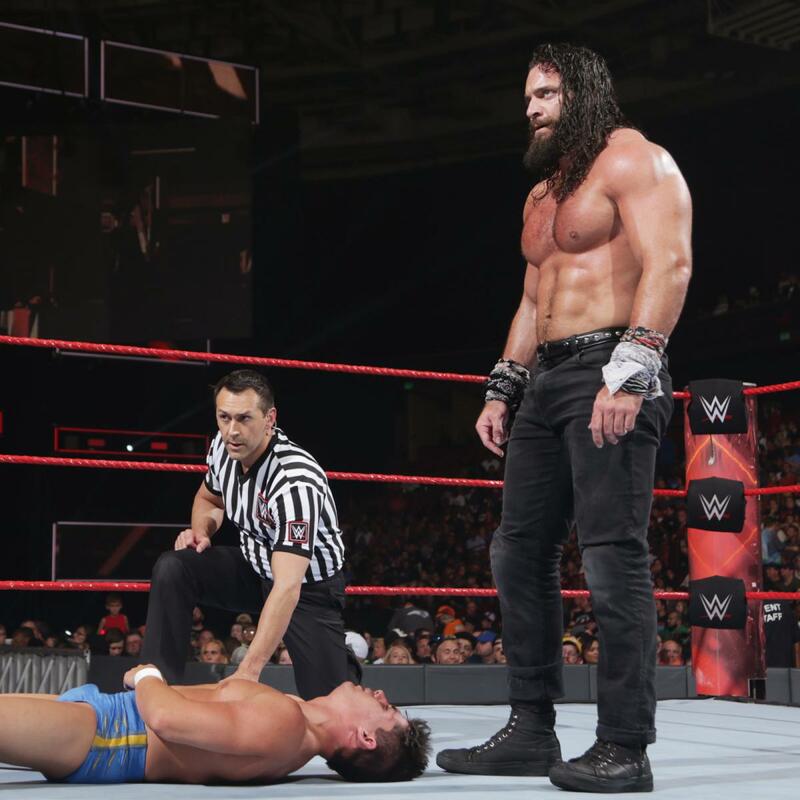 Elias Samson picked up his first pinfall win on RAW, picking up a squash victory over a lad called Zac Evans with a snap swinging neckbreaker. Samson brutalised Evans, bouncing him off the apron, wrapping him around the ringpost before delivering a running knee, a couple of forearms and finishing off with the neckbreaker. Considering Evans got absolutely no offence in this bout was surprisingly long and not only made Samson look credible but also like a complete jeb end for the amount of unnecessary punishment he dished. By the end of the match Samson was getting over with the Greenville crowd who seemed to be initially uninterested in him. The most thought-provoking part of the segment though was Samson's pre-match song in which he made reference to his match with Dean Ambrose last week, signalling that he owes Miz a favour for causing the DQ, which will almost certainly lead to Samson costing Ambrose the Intercontinental Championship at Extreme Rules on Sunday. Bray Wyatt hacked the feed as Samoa Joe was giving an interview with Charly Caruso, saying a series of weird words about angels and demons and things. A fun triple threat here that used it's mix of competitors well, told a decent story and worked as a good advert for the 4th June five-way. The structure was paint-by-numbers stuff, but there's a reason the layout has been used so many times. Joe and Wyatt initially both tried to get the other to fight Balor, however when this didn't work and we saw Balor hit a tope conhilo onto both heading into the break and when we came back Joe and Wyatt were working together an in control. You could see where things were heading, but when it arrived at that point, it wasn't any the less enjoyable for it's familiarity. Wyatt turned on Joe, hitting a lariat and pretty soon after, Finn launched into a comeback, that including sending both opponents into the barricade with front dropkicks and the crowd coming unglued. 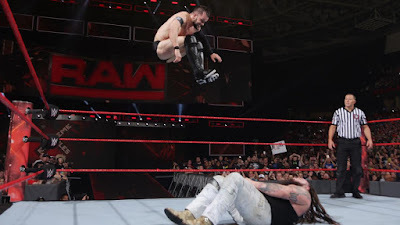 After the comeback came some of the best action of the bout between Joe and Balor, including Finn escaping the Coquina Clutch by running up the turnbuckles and hitting a double stomp, as well as Joe turning a Slingblade into an overhead belly to belly. The finish set up something that can be worked with at the PPV as Balor hit Coup de Grace on Wyatt, only for Joe to send Finn into the post and pick up the pin Bray. The finish got over the first fall to the finish idea that will be in play at Extreme Rules, showing how being in the right place at the right time can lead to the victory. This could be use to protect other competitors in the match for a future match with Brock Lesnar down the line and would also make for an effective false finish. The win gives Joe a much needed momentum boost, after two losses to Seth Rollins in the last month and also gives him another string to his bow after mostly winning via submission. Balor looked great through so didn't really need to take the victory here, whilst Wyatt has been protected well since jumping to RAW and has the ability to dust himself off from big losses because of his character and mic ability. Seth Rollins was interviewed by Mike Rome, with a relatively bland promo about his history with Roman Reigns ahead of their match later on. Not much to this Cruiserweight match with most of the work for the Mixed Tag Match at Extreme Rules with Sasha Banks joining Rich Swann and Alicia Fox joining Noam Dar already having being done. The two kept things simple with Dar working the arm with a couple of different holds, before a short Swann comeback. Having Banks get involved and knock an interfering Fox off the apron was probably the last touch the feud needed heading into the PPV and anything more would have been overkill and result meant that we saw Banks and Swann could make an effective team. Dar and Swann have potential to produce a great match together, but this wasn't really the time and neither did they have the time for it here. I'm not quite sure how I feel about Banks' ability as a dancer, but it's definitely something that happened. Charly Caruso interviewed The Revival, asking them about Enzo Amore's attack last week, bringing up footage of Scott Dawson & Dash Wilder (supposedly out injured) in the building last week...the mystery deepens. They showed highlights of the brilliant Street Fight between Akira Tozawa and The Brian Kendrick on last week's 205 Live, before Big Cass confronted Corey Graves following Graves' insinuating Cass had something to do with Enzo Amore's attack...the mystery deepens. Titus O'Neil picked up a quick victory over Kalisto, winning with a handful of tights as Apollo Crews looked on. Where to even begin with this segment. Bayley: This Is Your Life was absolute car wreck from start to finish. Bless Alexa Bliss for trying to make it entertaining, but it was poorly scripted and unnatural that it was almost physically painful to watch. Bliss is not an actress, so trying to get her to perform an acting segment solo with a couple of extra was a terrible idea on paper and a terrible idea in practice. Bliss looked uncomfortable with the lines she was reading and appeared to be desperately trying to make them fit her character, as she spoke to Mrs. Flapper ("Bayley's former teacher"), as well as "Bayley's ex best friend" and "Bayley's first boyfriend" about how much of a dweeb Bayley was. I'm not sure if in kayfabe these people were actually who Bliss said they were or if they were actors, nothing was ever quite made clear. After ten minutes of Bliss ripping into her for liking wrestling and being a "Daddy's girl", Bayley finally came out and then ended up getting beaten down anyway. Why on earth wouldn't Bayley come out straight away? Was she on the toilet? Well, that's where this segment belonged anyway. Enzo Amore was found unconscious backstage again, with Big Cass furiously telling Kurt Angle it was The Revival and vowing to stay by Amore's side going forward...the mystery deepens. 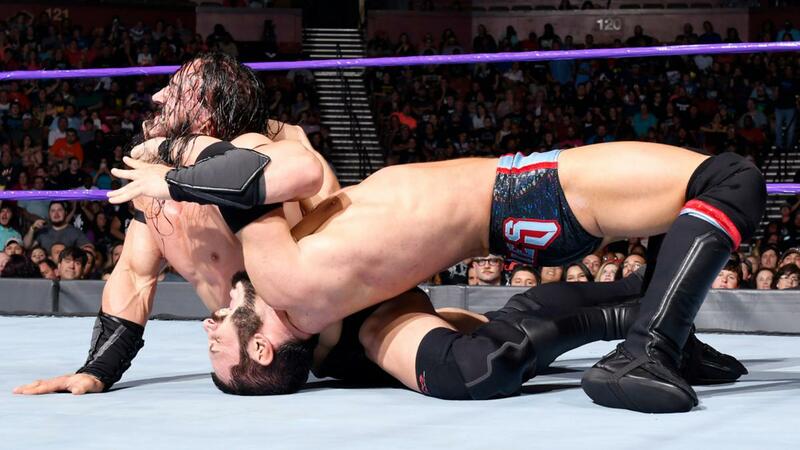 This bout was all about it's finish, as Cruiserweight Champion Neville tapped out to #1 Contender Austin Aries' Last Chancery just six days before the Greatest Man Who Ever Lived challenges for the King of the Cruiserweights' title at Extreme Rules. Following an Aries hot tag, that included some lovely overhand chops, the two worked a nice sequence of near misses as Neville dodged a missile dropkick and then Aries rolled out of the way of a middle rope Phoenix Splash and slid straight into the submission. The commentators hammered home the meaning of the tap out and the implications for the PPV title bout. Overall though the bout was needlessly long with Jack Gallagher working the face-in-peril role, being mostly worked over by TJP and nothing much of note happening. Take five minutes off this and you've got a much more exciting match that would've made the Cruiserweights stand out from the rest of the roster. The Cruisers need to feel different and at the moment there's nothing distinctive other than the lads being a bit smaller (or in Finn Balor's case the same size) than the main eventers. The Goldust and R-Truth feud continued with two rather good promos coming back to back. Both brought the intensity to their movie-themed monologues, getting over their distaste for each other, whilst remaining thoroughly entertaining throughout. An excellent TV main event here as Roman Reigns put away old friend and rival Seth Rollins in a match that may have been better than their PPV effort at Money in the Bank last year. 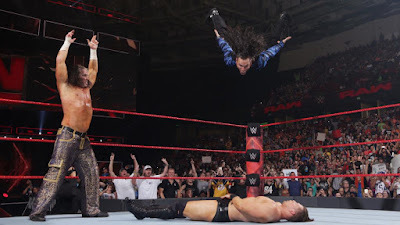 The two kept a great pace throughout their near 20 minute bout, starting with a hot back and forth sequence, that included a standing moonsault from Rollins, before beginning to tell a story that worked to the strengths of both men. The Kingslayer quickly became the babyface of the match, taking a Drive-by that sent him into the ringpost and injured his midriff, whilst Reigns zoned in on the injury and at times came across as a bit of a bully when in control of the match. 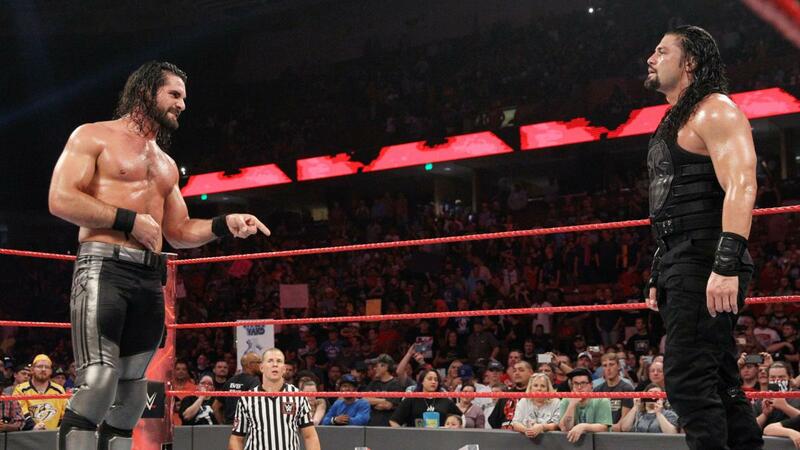 Rollins sold the injury well throughout, with some strong psychology after being unable to suplex the Big Dog and then later only getting two off a Frog splash after grabbing the ribs. The other thread was Reigns almost constantly attempting to hit the spear, which, of course tied in nicely with Rollins ribs injury, trying it at the start of the match, offering up a nice near fall for Rollins who turned on attempt into a school boy roll-up, ending up crashing into the steps, as well as having one blocked just before the finish. The finish was a nice series of near misses and reversal done at pace and concluded with Reigns' finally hitting the spear after dodging Rollins' rainmaker high knee. The pacing of the final few minutes of the bout was great stuff and concluded the episode with a heap of energy heading into the PPV. Reigns victory and his previous win over Finn Balor would seem to point to him not winning the Fatal Five-Way match, as he's been rightfully protected heading in and doesn't particularly need the win. I'd expect he'll have a programme with Brock Lesnar at some point and these victories keep him in a position to challenge for the Universal title. I was pleasantly surprised we didn't see any inference or post-match shenanigans with a cliche show-closing brawl and with the triple threat earlier in the show and the work that all five have done over the past three or four weeks there wasn't really any need for it. Two quality matches to build the Fatal Five-Way couldn't save this from getting a below average rating. This was mostly caused by the God-awful This Is Your Life segment which I'm still trying to get my head around, as well as the length of Elias Samson squash match and the nothing match between Rich Swann and Noam Dar. Considering we're heading into a PPV I'm not sure this show did enough to make anyone who wasn't going to watch Extreme Rules anyway, watch Extreme Rules on Sunday. There was a number of strong story beats, like Aries tapping out Neville, but for the most part the episode felt complacent and phoned in, in regards to both creative and handful of the performers.